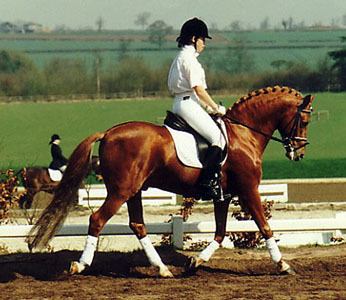 Broomford Dancer was a fully graded and performance tested German Riding Pony stallion who was registered with the Rheinisches Pferdestammbuch (Rheinland Studbook). Dancer was one of the first ponies to represent multiple nations at Pony FEI Level. Dancer was also a top sire with one of his sons, Golden Dancer, being a multiple Gold medal winning International dressage pony. 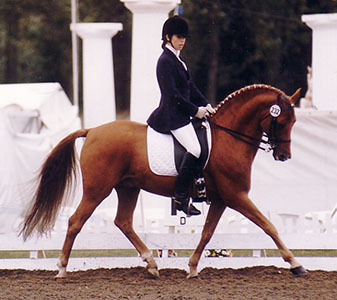 Dancer's name appears in the pedigrees of many current International dressage ponies. 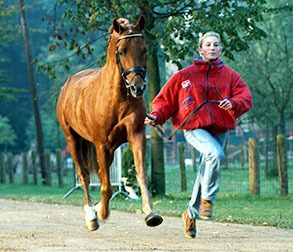 Dancer is pictured on the right with Marlies van Baalen at the 1994 Pony European Championships. Dancer was bred in Germany by Hans-Georg Boenniger and as a two year old, in November 1985, Dancer was initially licensed (graded) by the Rheinland Studbook in Aachen. Then in May 1987, he passed his performance test and was permanently licensed. 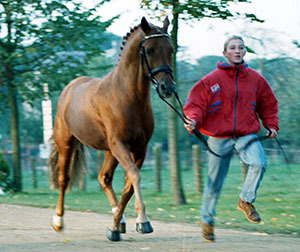 In May 1990, Dancer was bought by Bettina Hinnemann and they had their first win in June 1990. In September 1991, Dancer did his first international competition with Bettina when they competed at Sint-Genesius-Rode in Belgium. At this competition they placed first in two classes and second in the other as well as being on the wining German team. 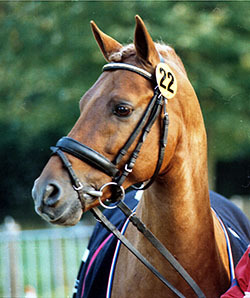 After Bettina outgrew Dancer, he was ridden by Marlies van Baalen and together they were part of the Bronze medal wining Netherlands dressage team at the 1993 Pony European Championships. Dancer scored 65.2% in the team test and then scored 65.74% and placed joint 8th Individually. 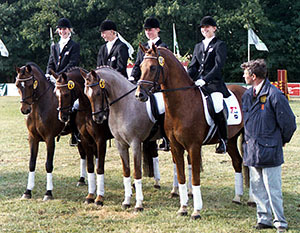 In 1994, Dancer and Marlies were again selected for the Netherlands Pony European Championships team and were the highest scoring Dutch pair. The team placed fourth although they had the same number of points as the Bronze medal wining British team. Dancer again scored 65.74% in the Individual Test for 7th place. By 1995, Dancer had been purchased by the Edmonds family of Broomford Stud and moved to the UK where, ridden by Charlotte Edmonds, he qualified for the 1995 Regional Dressage Championships at Medium level. Dancer, now known as Broomford Dancer, and Charlotte were also reserves for the European Dressage Pony Team that year. In 1996, Charlotte and Dancer were selected to represent GB at the Pony European Championships in Barthahus, Denmark, where they rode as Individuals. However, the next year, they were team members for the European Championships at Hartpury, UK and won the Team Bronze Medal. Charlotte continued to ride Dancer even when she was too old to compete him in the FEI Pony classes and together they competed up to Advanced level in the UK. In 1999, Dancer returned to Germany as a schoolmaster for the young Matthias Alexander Rath. Matthias competed Dancer for 6 months, winning at "L" and "M" levels and gaining valuable experience. Matthias has since represented Germany at Senior Team level, being part of the 2010 WEG Bronze medal winning team as well as taking over the ride on the top dressage stallion, Totilas, in 2011. 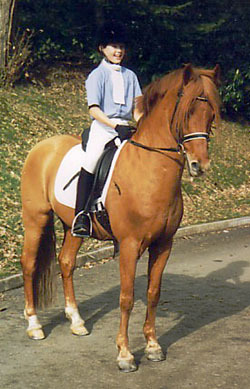 In early 1999, Dancer was also licensed by the Weser-Ems and Holstein/Hamburg Studbooks. After his return to the UK, Dancer was registered with the SPSS in 2001 and was awarded the coveted Elite graded status in recognition of both his own International pony dressage achievements and those of his progeny. In 2005, Dancer was again out competing as a schoolmaster for Alexandra Reeve, taking her from Novice to Advanced Medium level in 3 years. Dancer died in the late summer of 2010, aged 27, but his amazing legacy lives on with many of the dressage ponies at the 2010 and 2011 Pony European Championships being his descendants. Dancer is picture on the left with Olivia Edmonds at Broomford Stud and below competing with Charlotte Edmunds. 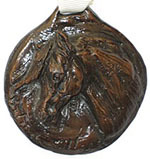 In 2007 the SPSS instigated an annual award and named it "The Dancer Medal" in Dancer's honour. The Medal is an original piece of artwork commissioned by the SPSS from Belinda Sillars and is modelled on Dancer himself. It is a discretionary award given annually, normally to a worthy SPSS registered pony that has achieved excellence in either competition or breeding. Dancer's sire was Dandy who is considered to be the foundation sire of the prolific German Riding Pony “D” line. At the 2010 Pony European Dressage Championships, 15 of the 28 German Riding Ponies competing had at least one occurrence of the sire Dandy in their pedigree. 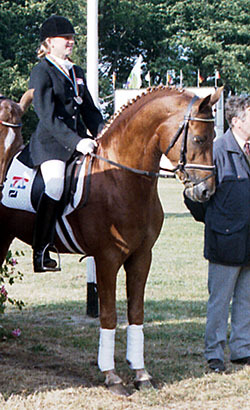 Dandy’s sire was the British Riding Pony Catherston Red Gold. Red Gold was bred by Catherston Stud’s founders, Col & Mrs Bullen, in 1960 and was sold to Germany as a yearling. Although himself a chestnut, Red Gold was double bred to the famous palomino Bubbly (Potato x Cwm Cream of Eppynt), who was National Palomino Champion ten times in England in the late 1950s and early 60s. Valerina is a daughter of the Welsh Sec B Downland Santolina who is by the famous Downland Chevalier who was a significant influence on Welsh Section B brreding1. Valentino was a British-bred pony who was originally registered as the British Riding Pony, Oakley Bubbling Bobbety before being exported to Germany where he was renamed and became one of the foundation sires of the German Riding Pony breed. Valentino's sire Bwlch Valentino whose period of success as a sire lasted longer than any other British Riding Pony stallion. 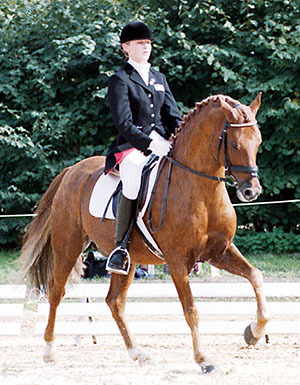 Arts-Dancer-Boy (born 1988) - competed to L-level dressage and, as well as siring graded stallions (including Arts-Deilahro 2000 & 2001 Bundeschampion), was the sire of Dulcia, 2000 and 2001 Bundeschampion mare and European Dressage Pony Individual Bronze medallist in 2003, Individual Silver medallist in 2007 and Team Gold Medallist in 2003 & 2004 & 2007. Golden Dream (born 1989) - a top broodmare. Her foals include Power & Paint (born 1993, European Pony Dressage Team Silver Medallist in 2002, 2003 & 2004, Individual Silver medallist in 2004, all for Holland with Marrigje van Baarlen), HB Daylight (born 2001, 2004 & 2006 Bundeschampion) and HB Golden Girl (born 2002, 3 year old Bundeschampionesse and multiple European Pony Dressage Championships medallist winning: Team Silver and Individual Silver in 2008; Team Silver, Individual Gold and Kur Gold in 2009, Team Gold, Individual Silver and Kur Gold Medal in 2010, all with Antionette te Riele (NED). Dancer Gold B (born 1990) - also a graded stallion, was 1993 3 year old Bundeschampion and has stood in Germany and Sweden. Dancer Gold B sired Dusty B, who qualified for the Bundeschampionsips in 2000. Donnerwetter (born 1991) - bred by Johann Hinnemann out of Kaprice (by Kirby Cane Bugler). Donnerwetter is the sire of Donnerblitz, who represented Team GB at both the 2006 & 2007 Pony European Championships, winning Team Bronze in 2007.